Life on Belmont Avenue was started during the summer of 2006 and completed in 2007. It’s a snapshot view of the street I lived on for 20 years. Both of my children grew up here. We fell in love with Belmont Avenue because of the beautiful view of Squaw Peak and were lucky enough to find the perfect home for our family just when we needed it. The clutter of cars shows that this was a Saturday or Sunday (during the week the street would be virtually deserted). It also reveals that this is a street of homes with one-car carports and families with at least two or three cars! The beautiful sunsets were always a special treat. 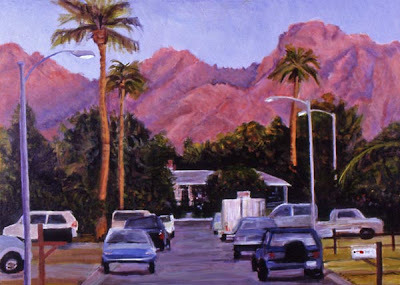 Our children have grown up and we recently moved to Ajo, in southern Arizona, where we now live at the Curley School, a wonderful old school newly renovated for artists to live and work in. It’s beautiful here and a wonderful opportunity for us to work full time as artists. I do miss our neighbors and our home on Belmont and am glad to have created this painting. Life on Belmont Avenue will be on display at the Joel D. Valdez Main Library in downtown Tucson from October 24th to November 26th.